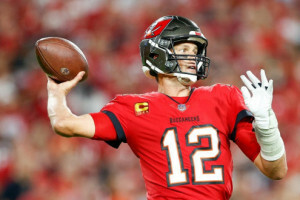 This NFL Strategy Guide will help ensure you’re using the best possible strategy when playing daily fantasy football (also known as weekly fantasy football) on FanDuel. The Main Forum – The place to talk NFL strategy, ask general questions, etc. GrindersLive and Podcasts – We’ve got lots of great media for those of you that don’t like to read! RotoAcademy – Check out the Free Tab for lots of great strategy content. Editor’s Note: Don’t yet have a FanDuel account? Our Fanduel Promo Code gets you the best deal. You’ll receive bonuses from FanDuel as well as 3 months of free access to our premium FanDuel strategy content ($75 value), which will build upon the guide below. Create your FanDuel account now! To excel with FanDuel football strategy, you need to master the aspects of the game that are specific to the site. The most obvious of those are the starting requirements, the scoring, and the way that they price their players. Note that the content below is intended for novice daily fantasy players. If you have daily fantasy football experience, be sure to check out our more intermediate and advanced material at RotoAcademy. 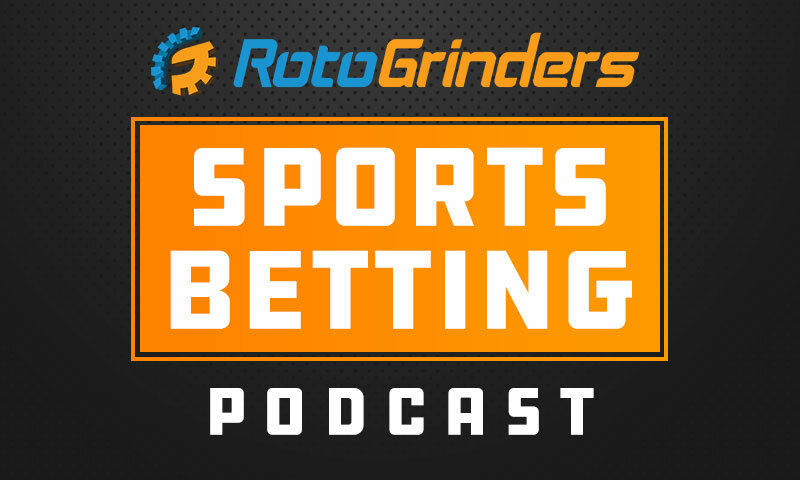 There, we walk you through topics such as building a foundation of NFL research, using the Vegas lines to help you pick players, understanding game variance, and the best approach for winning tournaments. FanDuel requires that you start one quarterback, two running backs, three wide receivers, one tight end, one kicker, and one defense. There’s no flex position, meaning there’s no need to compare players at different positions. You simply want to find the best values at each spot. The values are determined by figuring out how a player’s expected production compares to the salary that FanDuel gives him. The production is of course dictated by FanDuel’s scoring system, so let’s take a look at that. Quarterbacks receive 0.04 points per passing yard, or one full point for every 25 yards. This isn’t necessarily unusual, although many sites and season-long leagues award a point per 20 yards. At one point per 25 yards, it does decrease the value of passers just a bit. When fantasy football leagues give one point per 25 passing yards, they often “make up for it” by giving six points for all touchdowns. FanDuel doesn’t, awarding just four points per passing touchdown. That deflates the value of elite quarterbacks like “”(player-popup)Drew Brees”:/players/drew-brees-11605(player-profile)”:/players/Drew_Brees-11605, making it much easier to use a low-salary quarterback in your lineup. Since quarterbacks lose only one point per pick instead of two, there isn’t a ton of downside to starting high-interception passers. Again, this hurts elite quarterbacks like “”(player-popup)Aaron Rodgers”:/players/aaron-rodgers-11601(player-profile)”:/players/Aaron_Rodgers-11601 who protect the football, narrowing the gap between top-tier passers and mid or low-tier options. 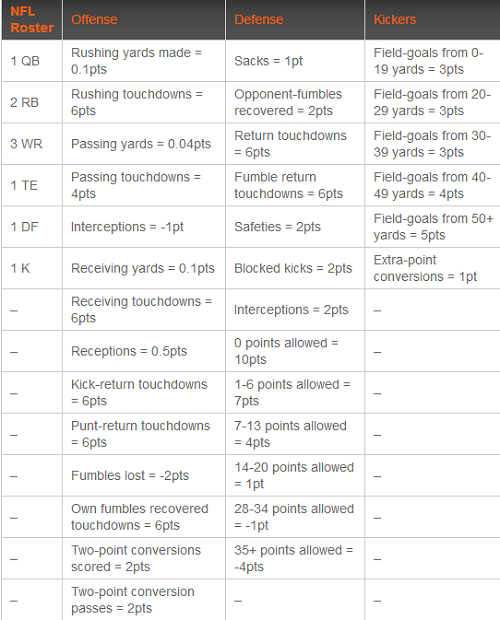 Perhaps FanDuel’s defining characteristic in terms of scoring is that they award only a half-point per catch, whereas most other sites and leagues are either full PPR (one point per reception) or standard (no points for catches). The 0.5-point per reception format gives a little extra value to pass-catching running backs and high-volume wide receivers/tight ends, but not to such a degree that you necessarily need to start them. It still always comes down to value, so if a running back who doesn’t catch many passes has a salary that’s too low relative to the number of points you’ll think he’ll score, he’s valuable. It’s important to note that the 0.5-point per reception scoring system can be of value to daily fantasy players who put in the time to do a little research. Most fantasy owners have a pretty good idea of player value in standard and full PPR leagues, but they don’t naturally grasp how 0.5-point PPR works. They often either treat it as though no points or a full point are given for receptions, which creates an advantage for those putting in the work to incorporate the 0.5-PPR scoring into their projections. You can get FanDuel-specific player projections in the RotoGrinders FanDuel NFL Incentives package. We also have a post on how to use the projections in Grinders U. Finally, note that kickers receive more points for longer field goals on FanDuel (four points for field goals from 40 to 49 yards and five points for field goals 50+ yards). On an individual level, it’s going to be really difficult and perhaps impossible to predict field goal length from game to game. It’s simply too random. But on a positional level, you can expect a wider gap for the elite kickers on potent offenses just because they’ll get more field goal tries in general, which will of course result in a greater quantity of long field goal tries. That’s not to say that you should be paying top dollar for kickers since their production is so hard to predict from game to game, but it could help justify paying a few hundred extra dollars for a potentially elite kicker (preferably one playing in good weather) who is priced too low. One of the most overlooked aspects of playing on any daily fantasy sports site is understanding how they traditionally price each position as a whole, and how that might affect your lineup structure. Like any other site, FanDuel has tendencies in pricing specific positions or types of players, and understanding them can help you exploit possible salary inefficiencies. 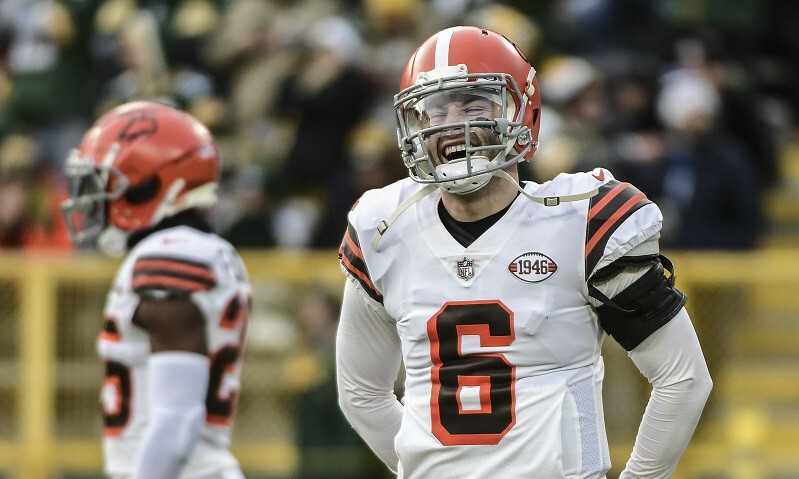 It’s important to know that pricing tendencies can always change, but one trend FanDuel has traditionally shown is that they have a relatively low ceiling on how high they’ll price elite players. Guys like “”(player-popup)Peyton Manning”:/players/peyton-manning-11849(player-profile)”:/players/Peyton_Manning-11849 and “”(player-popup)Jimmy Graham”:/players/jimmy-graham-11793(player-profile)”:/players/Jimmy_Graham-11793 are typically priced much closer to the middle tier than they are on other daily fantasy sites. Many times, FanDuel’s elite player pricing means you should implement what’s known as a “stars and scrubs” or a “high-low” strategy, filling your lineup with a combination of bargain bin values and top-tier studs, as opposed to a more balanced approach. You can find bargain bin players each week in the FanDuel Incentives. Another way that FanDuel’s pricing differs from many other sites is that there’s relatively little deviation from the top defense and kicker to the min-priced options. Whereas the min-priced (or close to it) defenses and kickers are typically the best values on other sites, that’s not always the case at FanDuel. Frequently, some of the top daily fantasy players pay up for elite team defenses, in particular, because they’ll often be within $1,000 (and often a lot less) of the worst options. You can learn more kicker and defense strategy right here. One of the things we’ve tried to do in RotoAcademy is structure lessons in such a way that it helps you understand the big picture for each daily fantasy sport—the approaches, strategies, research, and information you need to understand to be profitable. One of those lessons is called Developing a Routine and it covers how many pros go about making projections and creating lineups. 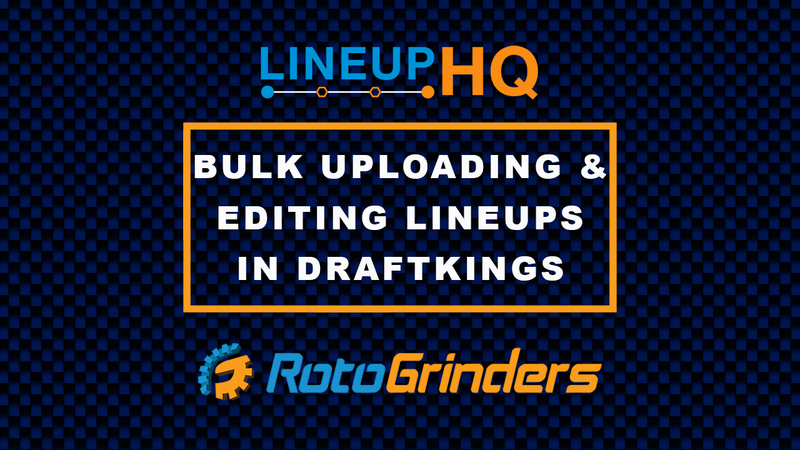 In regards to FanDuel, you should approach how you create lineups on the site in the same way each day, creating a routine to help you maximize efficiency. 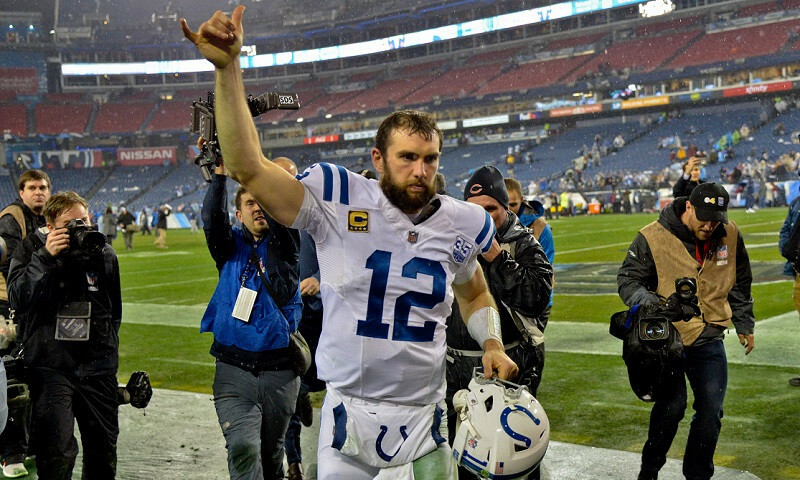 Another important topic that pertains to playing NFL on FanDuel is how to use the wisdom of the crowd—or consensus opinion—to make smart decisions. That’s important on FanDuel because the site actually shows you “ownership rates”—or the percentage of players who started each player—after the Thursday night game kicks off. Keep an eye on Thursday night for our “Field Report” articles to get a glimpse into Sunday’s ownership levels. In looking at these percentages, you can figure out which players are highly owned and perhaps ones that you overlooked. In tournaments, you can use the ownership rates to identify players who will be in a lot of the GPPs that you enter on Sunday. When you’re filling out your Sunday lineups, you might want to take a “contrarian” approach, bypassing the highly owned players to create a unique lineup. Here’s an example of why a contrarian lineup can be useful in large-field leagues. As it relates to FanDuel, the take-home point is to monitor those percentages at some point between Thursday night and Sunday morning. Finally, it’s important to match your game strategy to your league type using ceiling, floor, and consistency stats. 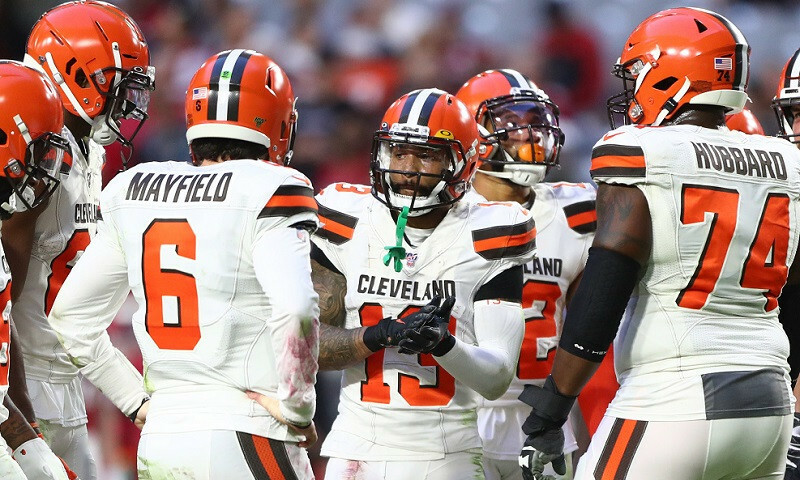 Because FanDuel has such an amazing assortment of head-to-head and 50/50 action—league types that require safety—you should often be searching for the types of players who are consistent from week to week and have high floors. In that way, projections are just as much about the probability of a player reaching a particular baseline of production as they are about the stats themselves. As always, make sure you get our FanDuel NFL Incentives for free by signing up for the site through any of our links, and check out all of the content at RotoAcademy. I’ve been playing for a while now but really haven’t won too much. Sometimes when I look at other players picks I think , how could he pick him when there was no logical information on that player. Then that player has a great fantasy day. Don’t figure! Sometimes I just think it’s crooked. Are the top players just playing many contests? Spending many $$$$.